Habit: Perennial herb 2--6 dm, hairy, silver to dull green. Stem: erect. Leaf: cauline; stipules 5--17 mm; petiole 2--6 cm; leaflets 6--9, 20--50 mm. Inflorescence: 2--23 cm, +- open, flowers spiralled to +- whorled; peduncle 2--8 cm; pedicels 2--6 mm; bract 2--8 mm. Flower: 9--12 mm; calyx upper lip 4--6.5 mm, 2-toothed, lower 3--7 mm, entire to minutely 3-toothed; petals pale yellow to lavender or violet, banner back glabrous, spot yellow to white, keel upcurved, glabrous. Fruit: 2--4 cm, silky. Seed: 3--6, 4--6 mm, mottled brown. Chromosomes: 2n=48. Unabridged Note: If recognized taxonomically, plants with spreading hairs, flowers 12--14 mm assignable to Lupinus adsurgens var. lilacinus A. Heller ex C.P. Sm. 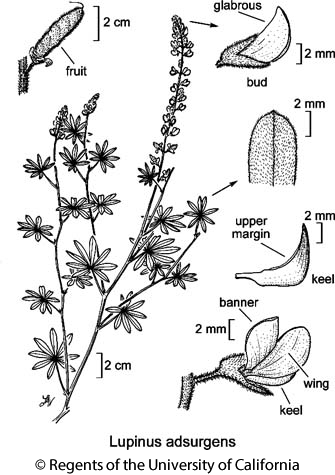 (see Lupinus antoninus), plants at 1000--3500 m in SN with wings +- > keel assignable to Lupinus adsurgens var. undulatus C.P. Sm. ; study needed. Citation for this treatment: Teresa Sholars & Rhonda Riggins 2012, Lupinus adsurgens, in Jepson Flora Project (eds.) Jepson eFlora, http://ucjeps.berkeley.edu/eflora/eflora_display.php?tid=31681, accessed on April 25, 2019. NCoR, SN, SnFrB (Santa Clara Co.); Markers link to CCH specimen records. Yellow markers indicate records that may provide evidence for eFlora range revision or may have georeferencing or identification issues. Purple markers indicate specimens collected from a garden, greenhouse, or other non-wild location.